Mission Moments: A Quiet Week! This has been a quiet week! We haven't been involved with a lot of activities. We've been able to catch our breath and catch up. Each week in District meeting the missionaries are asked to relate any miracles that have happened to them. When it came our turn this week we were able to announce that we had finally found a new house for the Elders that had been approved by the mission president's wife. We have looked at so many that were either too big, too small, too dirty, etc. This one is quite nice, and the owner is willing to add water heaters to each shower, of which there are three, supply a washing machine window coverings. It's close to where a missionary house is currently, but it will be closing soon. The new place will house the Farley Corner Elders immediately. Their present lease is up the end of May. If all goes well, the Elders should be able to move into their new digs next week. We attended the Chinese Branch FHE at the church on Tuesday evening. The Chinese Elders had the lesson. The first counselor in the Branch Presidency was there. With us, there was a total of five. It was fun, but sad that no one else came. The next night we drove out to Rantau Panjang, where many of the Branch One members live, for FHE with Brother Steven, his family, and President Gara and his family, and us. The ZLs gave the lesson and played a game that resulted in many new referrals for them. I'm going to make a copy of their game for future reference. Elder C created it when he was in Kuching. This is a picture of everyone playing the game. who may be interested in learning about the Church. We also went to Alexson's for a reading lesson Wednesday afternoon. He did really well today. I did some research and found a copy of the Dolch word list in English. This list comprises the 220 most often used words in the English language. 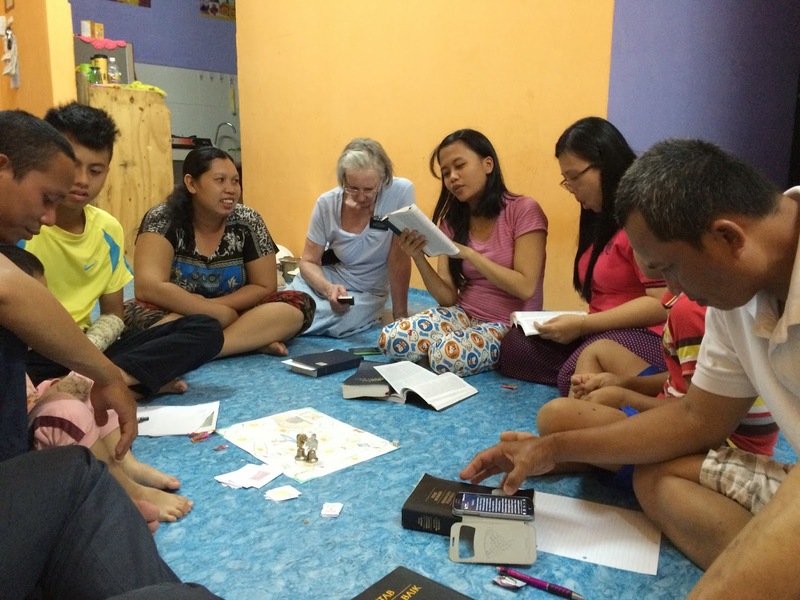 Elder L and I translated it into Malay. I've made several short lists for Alexson to practice in Malay. He was excited to start practicing. I think he'll be able to handle a new list or two each week. Friday's lesson with Alexson was good. He's getting more fluent. I told him that he had to practice, practice, practice. FYI: May 1, 2015 - Eight months ago we entered the MTC! Housing Update: President and Sister Mains have decided to close the Nuri house instead of the Farley Corner house. I guess it will all work out in the end. The Nuri house Elders will be moving into the recently acquired house, and the Nuri house will close. Sister Bodell and I have often driven past a particular Chinese park, but we've never had the time to stop. After doing a little shopping one day, we took the opportunity to stop. There is a beautiful pond, and the water lilies were in full bloom. It was rather spectacular. Thus, we have pictures to share of the park. It was a beautiful, sunny, hot day! The pond is covered with the water lilies. Nice panoramic shot. Click on the picture to enlarge. Today is May 3, 2015. Right now my emotions have the better of me. I started my fast yesterday. I personally felt the need to go a little longer that the normal 24 hours. Because of the length of time and the heat here, I made it a water fast. I have been blessed in so many ways, and today my cup o'reflowerth. We started the day with an Asian multi-stake conference broadcast from Salt Lake City. Sister Bodell watched it yesterday in English. Today we watched the Malay translation in both branches. It was an excellent meeting, very simple, but things the members in this area of the world need to hear and understand. There were many less-active members and investigators in both branch meetings. Just prior to the Branch 2 meeting, President Balley, the branch president, told me they were blessing their new baby today. That was good news, especially since he and his family have been unable to come to church the last few weeks. ... moto problems. When it came time to bless the baby, President Balley motioned for me to come up. No more problem until he also motioned that he wanted me to do the blessing. That pretty much floored me! This was very humbling honor and a blessing for me. I am grateful that I had been fasting so that I could act as voice for this ordinance. I am grateful to my Father in Heaven for blessing me with His Spirit so I could do so. I felt the Spirit strongly as I pronounced a blessing on this sweet little girl. I was also prompted to bless her family as well. Between feeling the Spirit during the blessing and again during the Sacrament hymn, I had a difficult time containing my emotions. I had to leave the chapel for awhile after the broadcast started so I could get those visible emotions in check. I am grateful for my testimony. I know that The Church of Jesus Christ of Latter-day Saints is, indeed, His Church. Jesus Christ restored the Church through His servant and Prophet, Joseph Smith. I know the Father and Son appeared to Joseph Smith in a grove of trees as a result of Joseph's humble prayer. I know we have apostles and prophets on the earth today. I know that Thomas S. Monson is a living prophet. Through him. Christ directs the Church. I also know that through the Power of God, Joseph Smith translated the Book of Mormon. It is the Word of God, written by prophets of peoples who lived on the American continents hundreds of years ago. If you haven't read it, or it's been awhile since you have, I would encourage you to so now. Your lives will be blessed. Our thoughts and prayers are with all of you. We love you. We appreciate your thoughts and prayers in our behalf. We ask that our Father in Heaven bless all of you.